The trip between Glasgow, located in Scotland and Birmingham, situated in England is well served by trains. The trains are operated by the following train companies: Cross Country, ScotRail, Virgin Trains. 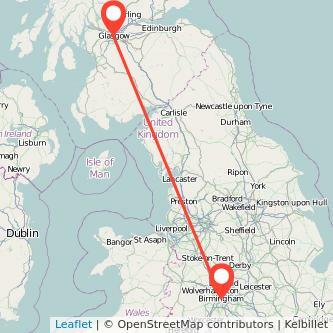 There are 253 miles between the 2 cities and the average journey time from Glasgow to Birmingham is approximately 4h31m. Taking the train is often the quickest option to get to Birmingham from Glasgow, and it's also more environmentally friendly than driving your car or flying. We found trains from £18.00 to travel in the next 30 days. Fares may change depending on the travel date as well as how much time in advance you book your ticket. Find the cheapest tickets to travel from Glasgow to Birmingham by train, bus, ride sharing and plane. When are the next trains to Birmingham? Based on our data, 14 trains from Glasgow to Birmingham are available today and 0 tomorrow. The first Glasgow Birmingham train leaves at 07:00 and the last one leaves the station at 23:03. The first and last departure times can vary every day and there can be fewer services during weekends as well as public holidays. Rail operators may also adjust the number of trains during school holidays or depending on the season. The Prices for train tickets Glasgow to Birmingham tend to increase the closer you get to your departure day. Based on our data, if you purchase your ticket 1 month in advance, the price of the ticket starts at £21 whereas when booking on the day you're travelling, you will need to spend at least £60 for your trip. Thus, you will save 65% on the price of your ticket by buying your ticket 1 month in advance as opposed to on the day you're travelling. We compare train ticket for all major companies to travel between Glasgow and Birmingham by train and find the best prices for the coming days. Take a look at the prices of train tickets Birmingham to Glasgow and find the best deal for your outbound journey. The best way to spend less on your Glasgow Birmingham train ticket must be to have a railcard. While regional railcards exist in some areas, National railcards enable you to make savings on most rail fares across the United Kingdom. Everyone is eligible to at least one of the railcard, even non-UK citizens. National railcards available: 16-25 railcard, Senior discount card, Two together railcard, Family and Friends discount card and Disabled persons railcard. To understand the savings that you can make with a railcard, you need to assess the number of journeys you need to make earnings. You will see that commonly only a few trips are needed. For your calculation, you must include the cost of your railcard, i.e £30, the discount on each journey (i.e. : 34%) as well as the cost of your ticket. The average cost of a Glasgow Birmingham ticket is £82.71 (1). Divide the cost of your railcard by the discount: £30/34%= £88. Then divide £88 by £82.71: £88/£82.71 = 1.06. You will need to make on average 2 trips from Birmingham to Glasgow (one way trip) with your railcard to start saving money.